The much awaited Mary Meeker’s report on Internet, Mobile and Digital has been launched; and unlike previous years, the reports focuses extensively on the usage pattern of Indians. While the report shares some interesting stats on how we Indians are using the Internet and consuming data at a rapid pace, the report credits Reliance Jio for bringing down data costs and mentions the onslaught of Chinese mobile manufacturers, who have dominated the Indian smartphone market. Overall, the report is pretty optimistic on the State of Internet and Digital in India, and indirectly predicts more mobile-based Internet usage in the country, in coming days. In the last one year, India has emerged as world’s #1 country in Android app usage and downloads. Close to 150 billion hours were spent by Indians on Android-based phones, which highest in the world, even overtaking the US, where less than 100 billion hours were spent on Android eco-system. 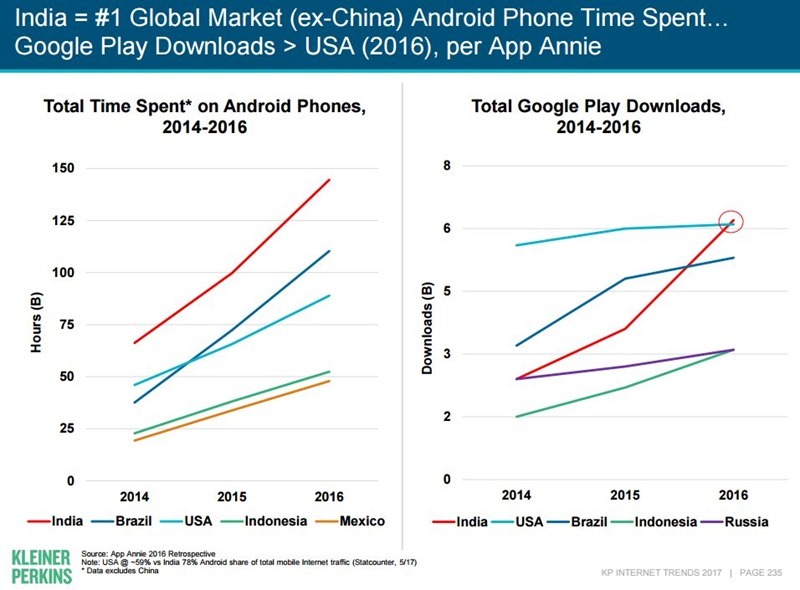 If we talk about Android app downloads, then Indians downloaded 6 billion apps from Google Playstore, which is more than what US Android users downloaded. 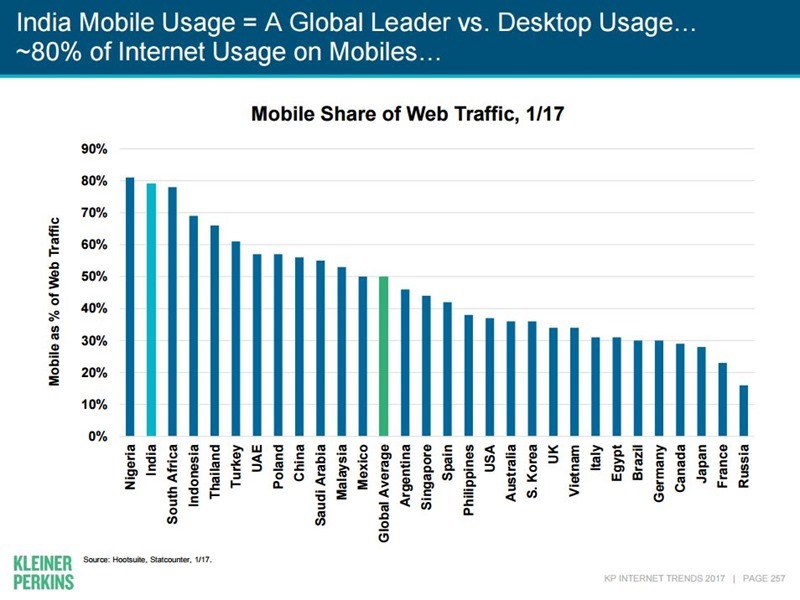 The report finds that India’s mobile web traffic is right now 80%, which is second only to Nigeria. No wonder that India’s smartphone market continues to grow at an incredible pace, making us World’s fastest growing smartphone market. As per the report, Indians spent 45% of their time on mobiles; and this is the reason that compared to TV, 7X more time is spent on mobile by Indians. Among activities, entertainment is the #1 activity for Indians on mobile, as it consumes 45% of the overall time spent on mobile. While Social Media was at #2 position with 34% time spent, news and media were at the bottom, with only 2% time spent on mobile. 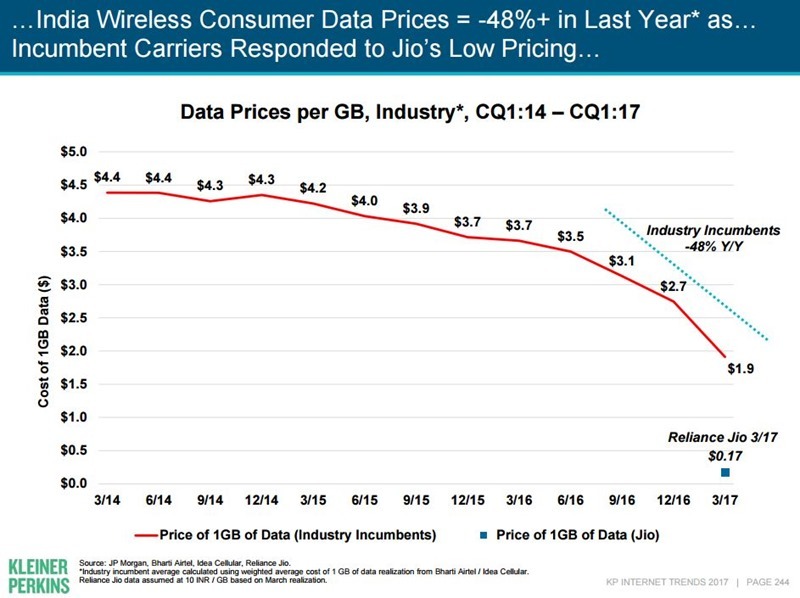 As per Mary Meeker’s, Jio was the catalyst which triggered a substantial reduction in data costs, across India. By March 2017, the average cost of 1 GB of data was reduced by 20%, and the entry of Jio was the sole reason. In March 2017, the average data cost of 1 GB was $0.33 or Rs 21, which included the average price of data provided by all telecom providers. Overall, since the arrival of Jio, data cost reduced by 10% on a quarterly basis, whereas voice costs reduced by 4%, every quarter. 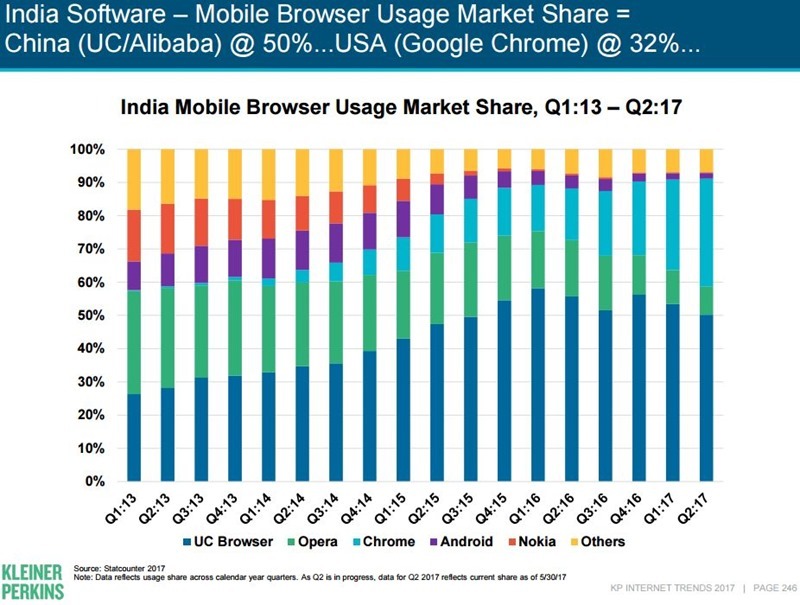 The report discovered an interesting stats: China’s UC Web has garnered a share of 50% in mobile browsers in India, thereby beating Google Chrome, which commanded 32% market share. Whatsapp, Facebook, ShareIt, Truecaller and Facebook are India’s top 4 used applications. Overall, there are 355 million Internet users in India, which makes us world’s #2 biggest Internet user base, just behind China. You can find the full report embedded below. 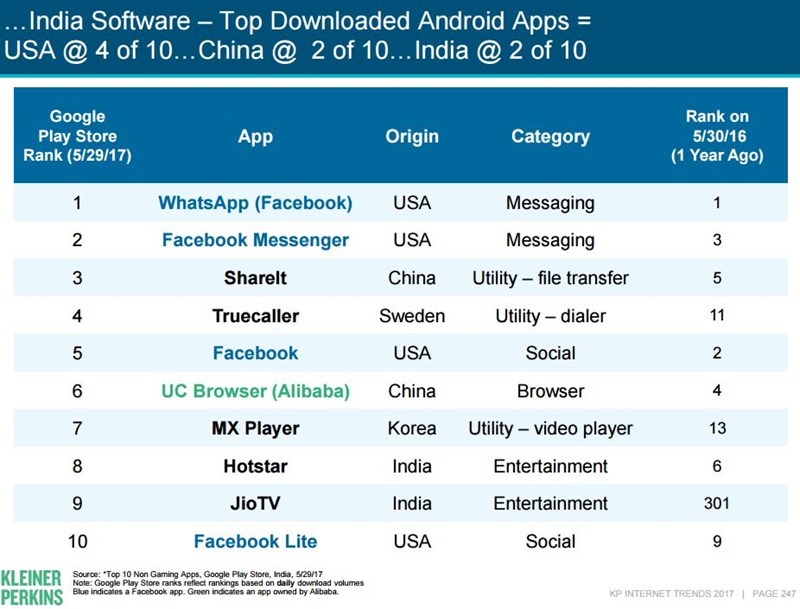 "Mary Meeker Internet Trends Report: India Beats US in Android Usage & Other Key Highlights", 5 out of 5 based on 1 ratings.